It’s that time of the season when I’m starting to get a little spring fever. In hardiness zones 9-11, the sun is getting sunnier, the weather is just warm enough to wear short sleeves during the day, and I’m tired of those goddamn radishes showing up in my CSA boxes. I swear if I see one more bundle of kale I’m going to run out and stomp on somebody’s raised vegetable garden. It’s not even that I harbor any serious ill will towards all those hearty winter greens, but there comes a point when I’m ready to see a zucchini or maybe even a tomato, and spring just seems to be taunting me. This has forced me to get a little craftier in my cooking lately—or as I like to think of it, my culinary creative stimulus package. The upshot: a big comforting meal leaning heavy on Southern, home-cooking that heats up the kitchen in the evening, but still feels light and summery. Enter: sweet tea, no lemon. I tweaked a Cooking Light recipe for oven fried chicken so it tastes even more like the real thing, with just a hint of spice. Some butter is involved here, but overall it’s a fairly healthy recipe. 2. Mix together buttermilk, egg white, and hot sauce in one bowl, and the dry ingredients and spices in another. 3. 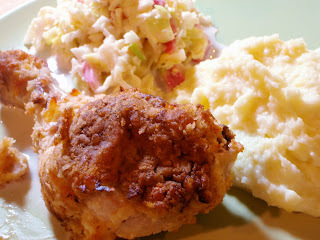 Dredge the chicken legs in the buttermilk mixture and coat them thoroughly with the panko mixture. 4. Heat an oven-safe pan over medium heat, melting the butter. Fry the drumsticks about three minutes on each side, or until browned. 5. Spray pan lightly with canola oil (chicken and all) and stick it in the oven. (If you don’t have an oven-safe pan, transfer the chicken to an oiled baking sheet, still remembering to turn it once during cooking.) Bake chicken about 30 minutes, or until juices run clear. (or test with a meat thermometer) Turn midway through cooking to ensure even browning. Turnips can make your regular mashed potatoes heartier and more complex. We used buttermilk and sour cream to thicken it up even more, and giving the veggie mash a rich, tangy flavor. 1. Boil potatoes whole with skins left on for about 25-30 minutes. 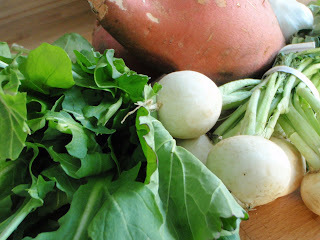 Add turnips to boiling water and cook (with the potatoes) another 15 minutes, or until turnips are tender. 2. Drain, and peel potatoes if so inclined. 3. Heat up the milk and butter just enough to warm. 4. Put root veggies in large bowl & add milk, butter, sour cream & buttermilk. Use a hand mixer to mash until the desired consistency is reached, adding salt to taste. *For a lighter, silkier mash, use white turnips. They usually come in a bunch, and only take about 10 minutes to cook. This is the best coleslaw you will ever have, seriously. 1. 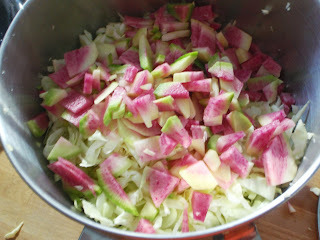 Shred or finely chop cabbage, add radishes and onion. Toss well. 2. In a separate bowl add mayo through celery salt and whisk until all ingredients are well integrated and smooth. 3. Add to cabbage mix, toss until well coated. Let stand for at least 1 hour. *Savoy is a lighter cabbage with crinkled leaves that is so easy to chop it practically shreds itself. It’s more flavorful than green cabbage, and has a nice crunchy texture when eaten raw. 1. Wash and rough chop the greens, and set aside, keeping the spinach separate. 2. Using an extra large frying pan, sauté the onion and garlic about 6 minutes, or until tender. 3. Add kale/greens and cook until almost tender (they should turn a bright green when ready), then add spinach and sauté until wilted. 4. Add butter and cream cheese, let soften/melt, and then add to food processor. 5. Throw in kosher salt and pulse until finely chopped, scraping sides if necessary. *Winter greens such as kale and mustard green are slightly tougher than some of their other counterparts, and require a slightly longer cooking time to soften up. In this recipe, I only remove the largest center stalks from the greens, because the entire mixture is going to be zapped in the food processor.